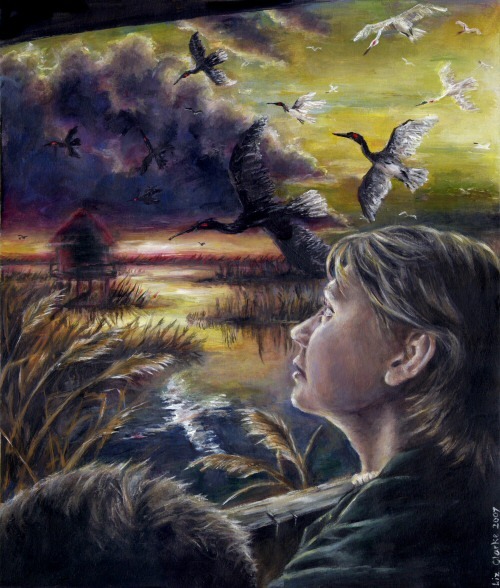 The birds were white as they flew over the marsh, across the reedbeds and the frosted meres, but as they drew level with the hide their shade changed, from white to black. I saw their crimson eyes, sparks in the cloudy dark, as they disappeared into the storm. Richard and I crouched in the hide and waited. "Jude, can you see her? Can you see?" Richard whispered. But all I could see was darkness, and the distant storm. People lived here once. A very long time ago, when this land was called the Summer Country: named not for cowslip meadows or hazy warmth, but because it only appeared in summer, when the waters had retreated towards the Severn Estuary and the marshes were dry enough to be negotiated on foot. During all other times of year, this land—gleaming wet marshes, dense beds of dull golden reeds, and groves of alder and unpollarded willow—was the haunt only of ducks and herons, and the small people who lived along the causeways and in the lake villages. Richard and my sister Clare and I had followed the Sweet Track the summer before, when the heat hung heavily over the water meadows, with the damselflies zooming through the kingcups that grew along the margins of the dug-out peat beds. The Track, discovered years before by an academic named Sweet, is an old road, one of the oldest in the country. I was researching it, and studying Sweet's own research, at the Moors Centre, lying right in the middle of Sedgemoor. Hard to imagine winter, in those dreaming meadows. But I knew that come September the fog would start drifting in from the Bristol Channel, smelling of salt mud and sea, hiding first the whale-humps of islands, then the arch of Brent Knoll, then the flat lands all the way to the Tor with its tower. After that would come flood and then frost, and the long, dim, damp winter. I'd been there for six months, but Clare was living in Manchester then, working as a fundraiser for some big arts project, and this was her first visit to the area. Her New Age soul was enchanted by it all, by the faux-Arthuriana of Glastonbury and the rather more real claims of Cadbury, by the startling caverns of the Mendips and the flat lands between, where the lake villages had once stood. She and Richard had apparently met through some university bird-watching society—though I'd never known Clare to be interested in birds before. She was more enthusiastic about it in summer, perhaps, out in the wilds with a couple of bottles of beer and a blanket, and that's how we discovered the hide. I hadn't realised it was there, although I'd been to the bird reserve a couple of times before. I must have walked right past it, but it was Clare who spotted it, as we walked along the track with the remains of a picnic in a rucksack. "Richie! Jude! There's a causeway, in the reeds. Can we go and look?" Moments later, she was gone. I remember feeling an odd moment of panic, as though she'd performed some unnatural conjuring trick. Then her voice came from among the russet tassels nodding several inches above our heads. "Look at this! This is so cool!" The causeway was built of slats placed on piles, close together and easy to walk on, with the addition of a handrail, which the original Lake Village structures would not have had. Quite contemporary and not all that old, judging from the scrubbed pallor of the wood. I'd have told her all this, but I'd grown too used to the rather glazed expression that came over Clare's face whenever I talked about my work. We'd both had our noses in books as kids, but they hadn't been the same ones. She liked the myths. She was less interested in fact. At first, I couldn't see where the causeway led. A dogleg in the middle took it out of eyesight, deep into the reeds. Clare and Richard vanished around the bend. I stood for a moment, just before the turn. The reeds swallowed sound. Distant traffic and the lowing of cattle were cut off, and the sudden rattle of a coot in the rushes made me jump. When I turned the corner, I saw that the little causeway ended in a long low structure, also raised on pilings, but with a tarpaulin roof and a laminated National Trust information sheet tacked to the wall by the door. There was nothing ancient about this place; it was not even a reconstruction like the round houses at the Bronze Age information centre some miles away. It was a bird-watching hide. As I came close to the door, I found something on the boards: a small black wing, very soft and dense. I didn't recognise the bird: this wasn't the right kind of terrain for blackbirds. Perhaps something—kestrel, maybe—had dropped it. It was clearly a recent kill; there was still a bloody fragment of meat on the bone, an electric red against the dull background of the planks. I picked it up and put it on the flat surface of the railing, not quite knowing why, as if it was a child's glove for which the owner might shortly return. 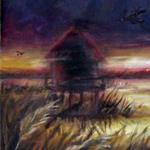 Inside, the hide was dark and still, stifling in the afternoon heat and filled with the limey odour of bird droppings. When my eyes adjusted, I saw that the floor was white with them. I looked up, but the rafters were empty. Swifts, perhaps, but I couldn't see any round hummocks of nests and they'd be in residence at this time of the year. "Richard?" Clare's voice cut through the gloom. "Come and see!" I went around the corner of the central notice board. Clare and Richard were standing shoulder to shoulder and I stifled an old familiar sensation. I allowed myself to wonder what would have happened if Richard had met me first—but I knew from experience that it wouldn't have made any difference. When she saw me, Clare raised the hatch that faced out over the other side of the marsh, and fastened it with a wooden peg. There was a heron among the reeds, a common enough bird in this area but still alien, predatory, as startling as a pterodactyl in its blue and grey plumage. It was stalking through the shallow water at the edge of one of the reedbeds and as we stared, breathless, the long beak stabbed downwards and came up with a fish. Silver caught the light. The heron flipped it up and swallowed, then was gone into the reeds in search of new prey. We kept looking for a moment, hoping it would come back. Then Clare said, "What are those?" 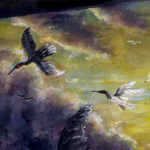 There were three of them, gliding over the crest of the reedbeds. They had long necks, long beaks, but at first I thought they must be gulls because their wings caught a shaft of sunlight, gleaming white as they turned. Then they veered again and I saw that their wings were shadow-black, a strange trick of the light. Cormorants, perhaps. They were common along the coast and you frequently found them inland, sharing prey with the herons. They were flying west, towards the estuary. We watched them go and then, as if some decision had been made, we filed out of the hide like obedient schoolchildren, into the hot day, and back along the track. Clare said she wanted to go back into Glastonbury and see some of the shops. She wanted to buy a crystal, or something. I just wanted a cup of tea. We headed back to where Richard had left the battered 2CV. The car park had been empty when we'd arrived, but now there were a few more vehicles in it. One of them was a van, painted in rough red and green stripes, a homemade hippie job. As we approached the car park, a young man came around the side: typical of travellers in this part of the world, dreadlocks, mud-coloured clothes, a joint held between two fingers. A dog skulked at his heels, a black and tan thing with heavy jowls and a surly look. But the young man was affable enough. "Nice afternoon," he said. "Been out to the bird sanctuary?" "Yes, just for a stroll. We saw a few things." "You want to wait for evening. All the starlings come then—like a cloud. Thousands of 'em. This place is known for it." "Starlings?" Clare asked. "Maybe we'll come back. We found the hide." "Did you, now?" the young man said. He took a drag on the joint; sultry smoke coiled into the warm air. I thought there was a fractional sharpening of his interest, but perhaps it was only the dope. "See anything?" "A heron," I said. He nodded, interest waning, until I added, "And some cormorants." "You saw those?" He was staring at Clare, not me, half amused, half something else, an expression I could not identify. But that he was looking at her at all irritated me. "Black or white?" "Black," I said, not understanding. "You don't get white ones, I thought." "Sometimes you do." The young man spoke with assurance and I didn't know all that much about birds. I wasn't prepared to argue the toss. "How many?" "Three. There were three of them." "Okay. Well. Let's hope you don't see them again." I was about to ask him what he meant but he turned away, clicking his fingers at the dog, which was wandering. Richard opened the car and we drove into Glastonbury, where Richard and I spent the rest of the afternoon in one of the little cafés around the market cross while Clare shopped. If I thought about the bird sanctuary at all, then or in the days that followed, it was simply as a fading memory of a half-pleasant, half-painful afternoon. I did not think about the cormorants at all. For the next few months, I was busy with research in the Centre and elsewhere. Richard and Clare went back up north and I tried not to wonder when I'd see Richard again. I knew I'd never be able to tell her how I'd started to feel about him, and I didn't want to. There was something behind the New Age stuff in her, something competitive and deep, something sisterly, and not in a right-on feminist way. Anyway, it was too embarrassing to talk about and God knows it wasn't as if it hadn't happened before. Perhaps she knew what was going through my head, all the same. I told myself that she seemed happy with Richard and I should be happy for them, and could not be. There should be a natural end to it, now they had returned to the north. But when I next saw them, and summer itself was over, I found that things weren't as I'd thought. I'd been to a conference at Lancaster, stopping off at Clare's on the way back. But when I got to her place, she wasn't there. Instead, I found Richard. She'd been moody ever since they came back, Richard told me, over a glass of wine in a nearby bar. It was October now. At first he'd put it down to anxiety over the coming months, the time when the success or failure of Clare's fundraising bid was going to be decided. She was snappy and short-tempered, which was new to Richard if not to me, and he'd deemed it wiser to leave her alone to get on with her work. At first, he thought this approach was a success: she was heading off to the office every morning, but three weeks or so later he had run into a colleague of Clare's, who asked how she was, given that she was on sick leave. "I didn't want to ask her about it," Richard told me. He took a sip of his drink. "But it freaked me out. I thought—I thought she'd found someone else, but, you know, sick leave, it's not just sneaking off for an hour or two." "Is there someone else?" I felt a cold growing elation at what he was about to say and I hated myself. "No. I don't know. She said there wasn't, but I—I didn't believe her. I told her I did, then when she went out the next morning, I followed her. She went straight to the canal and sat on the bank. For the rest of the day, as far as I could see. I went to a pub for lunch, even, and when I came back, she was still there." "Maybe she reckoned you'd follow her, and she thought she might as well lead you on." "Maybe." He looked dubious. "I suppose I wouldn't have blamed her." "Funny place to sit, the Ship Canal. It's not exactly Hawaii." Richard looked suddenly defeated. I nearly reached out to him but stopped myself in time. "It's a shithole, Jude. They keep saying they cleaned it up for that sports bid, but it's still a murky, dirty drain. What appeal could it possibly have?" Unless you were thinking of chucking yourself into it, I thought, but did not say, and I hated myself a little more. There was something gruesome about the idea of my sister sitting by the side of that grim channel of water, staring into grey scummy nothing, contemplating what? "Did you follow her again?" I asked. "A couple of times. She went back to the canal once, and then the next time she just wandered around. This was a few days ago." "Do you think she's having some kind of breakdown?" "I don't know. She's been worried about her work, thinks they screwed up on the funding bid, didn't have enough of the required elements. I tried talking about it last night and she said she thought she needed a break. I was wondering if she could come down to you for a few days. I know it's not exactly the weather for it, but it's not the weather for perching on the side of the bloody Ship Canal, either." All I could see in his face was concern. I had the sense of a trap, closing. I bit back what I had so nearly told him and felt something brush my clenched hands under the table, something soft, like feathers. "Of course she can come," I said. Having her in the house was odd and awkward, even more so because Clare exhibited none of the signs of anxiety or depression that I'd been expecting. That made me think that the main problem lay with Richard and that, of course, gave me hope. But I told myself that I was being stupid. Clare and I went out to dinner at the local pub on the night she arrived, and when we got back to the house I bolted up to bed before we really had a chance to talk, not that we were likely to. She'd never been in the habit of opening up, after all. I went to sleep quickly, but in the middle of the night, something woke me up. I sat up in bed, clutching at the covers. There was no one in the room, but it smelled dank, like marsh water. Worrying about damp-proofing and winter, I went back to sleep. In the morning, Clare was gone. I sat at the kitchen table, worrying and wondering if she'd gone off like some marsh spirit, wandering the Levels in the morning mist. Twenty minutes after I'd drunk my second cup of tea, she was back, looking rosy-cheeked and cheerful, and announced that she'd been for a walk down the lane and had met a nice horse in a field. The canal-haunting woman whom Richard had described seemed to have flown like the mist itself, upwards into the sunlit air. I had to go to the Centre that morning, so Clare said she'd come with me. I spent the next couple of hours going through records, while Clare—I learned at lunch—had passed the morning in looking through the information section, learning about the Lake Villagers. "I'm surprised how much is known about them," she said, over soup and bread in the Centre's café. "Well, peat preserves things. If the structure's there, then you can build up guesstimates from that. I'll have to show you some of the computer reconstructions: I've got some on CD back at home." "It's fascinating," Clare said. "Like a world built on water." I stiffened, anticipating canal revelations, but all she said was, "It must have been bloody cold in the winter." It wasn't exactly warm that afternoon. We went into Glastonbury for a cup of tea and there was a distinct sense of the year beginning to wind down, a faded quality to the light, a bite on the wind's breath. "I keep thinking of that afternoon we spent down here," Clare said in the café. She was looking down at the table, playing with her teaspoon. "Do you remember? 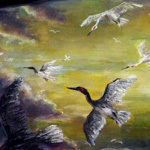 Everything golden and grey, and the birds in the reeds." "That was the day we saw the cormorants." "I've dreamed of them, you know." She spoke with a sudden rush, as if confessing something forbidden. "They keep changing. Sometimes they're black and sometimes they're white." "Things stick in your mind," I said. "When I was a kid, we went to Tenby for a holiday—there's a fortress on a rock, just beyond the bay, and I still dream about that sometimes." She nodded, but she looked slightly disappointed, as though she had been expecting me to say something else and I'd let her down. We did not discuss when she might be going back. Next day, I went to the museum, but Clare did not come with me: she said she wanted to sleep in. Still nervy about signs of depression, I didn't attempt to dissuade her. When I got back to the house about mid-afternoon and found a note saying that she'd gone out for a walk, I wasn't worried. But she didn't come back. It was dark by six and I was starting to get seriously freaked out. I tried her mobile and got her answering service, left messages. I got the car out and drove into Glastonbury, wondering whether she'd gone into town. But I did not see her along the road, and she wasn't in any of the pubs. I drove back, hoping to find her at home, but the house was as dark and silent as I'd left it. I didn't want to ring Richard, but if it turned out that something had happened to Clare, I wouldn't have been able to face myself. His landline rang and rang; I tried his own mobile and that, too, was switched off. I left more messages, tried to decide whether it was too early to call the police and then decided that I'd rather look like an idiot than risk Clare's life. It was cold outside, with the stars hanging heavy and burning over the low black land. The police took me seriously, though with a certain weariness, but said there was little they could do. If Clare continued to be missing, then they'd initiate a search, but until then, all they could do was keep an eye out and wait. The implication was that I should do the same. When the doorbell rang, all my foolishness came crashing in on me. She had got lost and forgotten her key, that was all. I threw the front door open. "Clare, I'm so—" But it wasn't Clare. It was Richard. He didn't seem to know anything about my phone messages. He said that he was there because he had had a dream. He was dishevelled, a bit stare-eyed, and he smelled dank, the sort of smell you might acquire on too close an acquaintance with the greasy waters of the Ship Canal. Both this, and the account of his dream, were completely out of character: the only thing that made me listen to him at all, rather than insisting on rest and a bath, was the fact that he knew Clare was missing. My mind, wandering in areas that I did not understand, started to invoke further paranoia. This was all some weird game, either involving me or, worse still, directed at me. They had set it up between them, it was all planned. But then Richard started to tell me about the dream itself. "She was walking in a dark place. She was lost, and there was a storm, but no rain. I knew that it was cold, and then I saw that she was out on the mere. You know, where we went for a walk? Where we saw the hide? And the hide was in the dream, too—I knew that if she could get to it, she'd be okay, we could pull her back. But then I saw the birds." "The birds?" But I already knew which ones he meant. "The cormorants, or whatever they were. Long necks, sharp beaks. They were white when I first saw them and as they flew towards her, they changed to black. Then it started to snow and the snow was black, too, like little beads of jet, and it covered her, she stood still like a statue and when I touched her, I realised she had turned to peat and she crumbled into the water." There was a long silence after he recounted his dream, but it was just a nightmare, nothing more. Wasn't it? Richard was staring ahead into the heart of the fire as if trying to conjure its warmth back into his bones. He said, "She's out there, Jude, and we have to find her. We have to bring her back." His eyes were burning and he looked thinner since I had last seen him, as if he'd aged in the past few days. I did not know what to make of his dream, but it was easier to leap up and go out, knowing that I'd already contacted the police and could do no more if we stayed home. Knowing that action was always easier than just sitting, with the unspoken accusation ringing in my head: it was under my care that Clare had become lost. "Let's go, then," I said. October had borrowed a night; when we stepped outside it felt more like the middle of January, a raw moonless landscape with the mist breathing off the ditches. A bone-coldness, seeping in even through my Barbour jacket and fisherman's sweater. I thought of Clare staring into a canal for hours at a time, and I grew colder still. We took the car out to the bird sanctuary, driving slowly with the window down so that Richard would spot her on the road, if she should come that way. But we passed no one on the road and once we had turned into the track that led to the bird sanctuary car park, the night closed in, a clammy dark with the stars swallowed by cloud and the reedbeds swimming out of the mist. Richard was out of the car even before I'd switched the engine off, walking quickly towards the hide. I had to run to catch up with him and he did not turn to see whether I was with him or not. He was looking straight ahead, like someone possessed. We reached the hide. As we did so, a breeze sprang up, but it didn't seem to make any difference to the mist. I thrust my hands further into my pockets and found something brittle and sticky in there. I pulled out the black bird's wing that I'd found on the way to the hide, the last time we'd come. I remembered leaving it on the rail. There was no smell, but the bloody flesh had not clotted, it was still moist, and cold as ice. I was so revolted that I nearly dropped it, but then I heard Richard's voice, calling my name, and I stuffed the thing back into my pocket and ran along the walkway. He was standing in the entrance to the hide, clutching both sides of the doorframe. His face was suffused with a kind of strange joy. He said, "Jude! It's okay. She's here." "What? Is she all right?" I had visions of Clare collapsed, huddled against the wall in a disorientated daze, but when I pushed past him into the hide, limp with sudden relief, no one was there. "She's there," he said. He gave me an odd look, as if I was behaving like an idiot. He pointed to the shuttered window of the hide. The shutters were raised, angling out onto the reedbeds. It was pitch black in here, apart from the tiny light of my torch: I couldn't believe that he'd managed to see anything. Then I looked through the shutter, and saw for myself. There were more than three birds. This time, there was a flock, perhaps twenty or more, flying from east to west. I saw a smear of pale light in the east, like the grey minutes before dawn, and on the western horizon, just above the reeds, a thin red line in the sky with the storm clouds rising above it. The birds were straggling, and the ones in the east were white, but as they passed the hide, I saw the darkness melt over them, changing them to black. Richard whispered, "Jude, can you see her? Can you see?" The reedbeds were the same, but nothing else. There was a kind of house opposite the hide, a hut on stilts. It stood in a patch of reeds, but I saw, as you see in dreams, that they were black, with crimson tips that looked like ragged bulbs of flesh. Clare stood on the balustrade that surrounded it. I leaned out, shouting. "Clare! Clare, can you hear me?" A shutter rattled, from across the water. A black oblong opened at Clare's shoulder, and something looked out of it. I saw myself looking at my own face, but it was changed: I looked older, lined, bitter. Across the water I saw myself raise something and wave it in mockery: something black and dripping, like the blood-drenched wing of a bird. Then the face changed and was no longer mine, was no longer anything human. There was a splash. 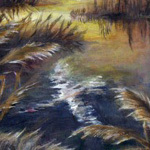 I looked down, and Richard was in the water, ploughing through the reeds towards the opposite hut. "Richard! Don't go, come back!" I might as well have been whispering. As the last of the birds reached the hide and changed, I saw Clare bend over the rail and reach down a hand to pull Richard up. The bird in the sky changed to black. I saw its reflection, shining white in the water below, the light breaking the water up into a thousand dazzling splinters and the hide, the fleshy reeds, the gleam on both sides of the sky, everything was gone. I was alone, and it was night, and it was cold. I would like to say that after I made my way home in a daze, I woke up the next day to find it had all been a dream. But Richard's rucksack was there to remind me, and Clare's belongings, and a message from the police to ask me to let them know if she appeared. She did not. 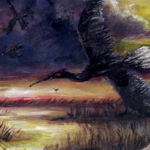 There was a hunt, and they dragged the waters of the bird sanctuary. I went with them, although the place terrified me. They found nothing. They asked me a lot of questions, but I did not get the sense that I was under suspicion. The case made the papers, and after a while, the authorities and the media lost interest. I had dreams, too. They were always the same: two dark birds, flying west. I thought a lot about the bird sanctuary, about the kind of place it might be. I thought of the people of the Summer Country, living in the liminal lands between sea and pasture, summer and winter, life and death. The area around Glastonbury was known to be the land of the dead, the Celtic lord of the dead dwelling beneath the Tor. I did not know if this was what I had seen, some kind of ancient conjured hell, filled with spirits that I, with my imperfect human sight, could only see as birds. But I gradually came to think that it was simpler than that: that just as we had gone to the hide to spy upon the life of birds, so something somewhere else had also set up a hide, to watch us, and when the time was right, to take. Liz has had over 40 short stories published in Asimov's , Interzone , Realms of Fantasy , and The Third Alternative , among others, and is co-editor of the recent anthology Fabulous Brighton . She is also the current secretary of the Milford UK SF Writers' Workshop. Her previous publications at Strange Horizons can be found here. For more on Liz Williams's work, see her website. To contact her, send her email at liz@arkady.org. Liz Clarke is a freelance illustrator living in Cape Town, South Africa. Her work has appeared in Aberrant Dreams , Tales of the Talisman , Midnight Street , Shimmer , Monomyth , Space and Time , Orson Scott Card's Intergalactic Medicine Show , Jim Baen's Universe , Heliotrope and Spacesuits , and Sixguns Magazine . For more on Liz Clarke's work, see her website. To contact her, send her email at lizclarke@iafrica.com. Liz Williams is the daughter of a conjuror and a Gothic novelist, and currently lives in Brighton, England. She has a Ph.D. in philosophy of science from Cambridge, and her anti-career ranges from reading tarot cards on Brighton pier to teaching in Central Asia. She currently writes full time. Her novel The Ghost Sister was published by Bantam in July 2001. Further novels include Empire of Bones, The Poison Master, Nine Layers of Sky, and Banner of Souls (due fall 2004), now out in the USA with Bantam and the UK with Tor Macmillan.